Switching feature allows wire speed traffic passing among a group of ports, like the ports were a regular ethernet switch. You configure this feature by setting a "master-port" property to one ore more ports in /interface ethernet menu. A 'master' port will be the port through which the RouterOS will communicate to all ports in the group. Interfaces for which the 'master' port is specified become inactive - no traffic is received on them and no traffic can be sent out. ether3 is now the master port of the group. Note: you can see that previously a link was detected only on ether5, but now as the ether3 is a 'master' the running flag is propagated to master port. Here you can see that, a packet that gets received by one of the ports always passes through the switch logic at first. Switch logic decides to which ports the packet should be going to. Passing packet 'up' or giving it to RouterOS is also called sending it to switch chips 'cpu' port. That means that at the point switch forwards the packet to cpu port the packet starts to get processed by RouterOS as some interfaces incoming packet. While the packet does not have to go to cpu port it is handled entirely by switch logic and does not require any cpu cycles and happen at wire speed for any frame size. Since RouterOS v6.41 there are user interface changes which convert RouterBoard master-port configuration into a bridge with hardware offloading. From now on bridges will handle all Layer2 forwarding and the use of switch chip (hw-offload) will automatically turn on if appropriate conditions are met. The rest of RouterOS Switch features remain untouched in usual menus. By default all newly created bridge ports have hw=yes option and it allows enabling of hw-offload when possible. If such functionality is not required, it can be disabled by hw=no on bridge port to have completely software operated bridging. Note: Downgrading to previous RouterOS versions will not restore master-port configuration. The bridge with no hw-offload will appear instead and master-port configuration will have to be redone from the beginning. Following table states what features currently in v6.41 keeps bridge hardware offloading enabled on certain RouterBoard and switch chip models. Vlan tag id based forwarding takes into account the MAC addresses dynamically learned or manually added in the host table. QCA8337 and AR8327 switch-chips also support Independent VLAN learning (IVL) which does the learning based on both MAC addresses and VLAN IDs thus allowing the same MAC to be used in multiple VLANs. The option "independent-learning" in VLAN table entries enables this feature. Routerboards with Atheros switch chips can be used for 802.1Q Trunking. This feature in RouterOS version 6 is supported by QCA8337, AR8316, AR8327, AR8227 and AR7240 switch chips. In this example ether3,ether4 and ether5 interfaces are access ports, while ether2 is a trunk port. VLAN IDs for each access port: ether3 - 200, ether4 - 300, ether5 - 400. Create a group of switched ports by selecting one master-port and setting it for other ports. Assign "vlan-mode" and "vlan-header" mode for each port and also "default-vlan-id" on ingress for each access port. Setting "vlan-mode=secure" ensures strict use of VLAN table. Setting "vlan-header=always-strip" for access ports removes VLAN header from frame when it leaves the switch chip. Setting "vlan-header=add-if-missing" for trunk port adds VLAN header to untagged frames. "Default-vlan-id" specifies what VLAN ID is added for untagged ingress traffic of the access port. Create a group of switched ports. In switch port menu set "vlan-mode" on all ports and also "default-vlan-id" on planned hybrid ports. "Vlan-mode=secure" will ensure strict use of VLAN table. "Default-vlan-id" will define VLAN for untagged ingress traffic on port. In Gigabit switch chips when "vlan-mode=secure", it ignores switch port "vlan-header" options. VLAN table entries handle all the egress tagging/untagging and works as "vlan-header=leave-as-is" on all ports. It means what comes in tagged, goes out tagged as well, only "default-vlan-id" frames are untagged at the egress of port. This example will show one of the possible management IP address configurations. Management IP will be accessible only through trunk port and it will have a separate VLAN with ID 99. Add VLAN table entry to allow management traffic through switch-cpu port and the trunk port. Configure the port which connects switch-chip with CPU, set "vlan-header=leave-as-is" because management traffic already should be tagged. Add VLAN 99 and assign IP address to it. 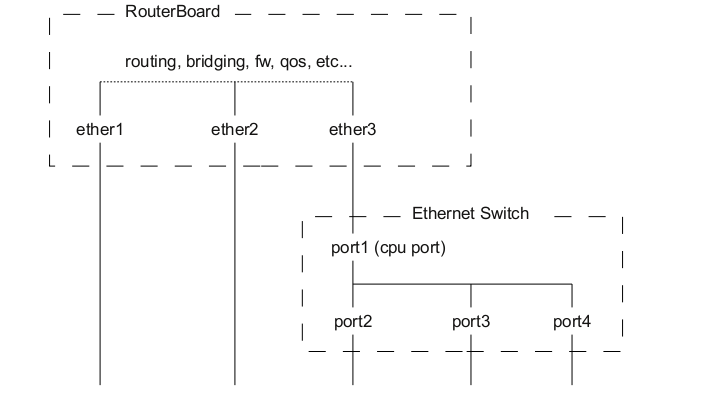 Since the master-port receives all the traffic coming from switch-cpu port, VLAN has to be configured on master-port, in this case "ether2" port. Starting from RouterOS v6.38 RouterBoards support Spanning Tree Protocols on ports configured for switching. This feature is available on following switch chips: QCA8337; Atheros8327; Atheros8316; Atheros8227; Atheros7240. To enable this feature create RouterOS bridge interface and add the master-port to it. Slave ports are dynamically added to the bridge only to show STP status. Forwarding through switched ports still are handled by hardware switch chip.